When frogs lay their eggs in creeks, ponds and other waterways, the eggs don’t hatch into tiny frogs -- when they hatch, they're tadpoles. These free-swimming frog larvae have gills like fish and long tails instead of legs. They'll undergo metamorphosis over time and will end up with lungs instead of gills, and four legs to hop around on. Their diet will change as they begin to eat like adult frogs, but while they're tadpoles, they eat other foods. 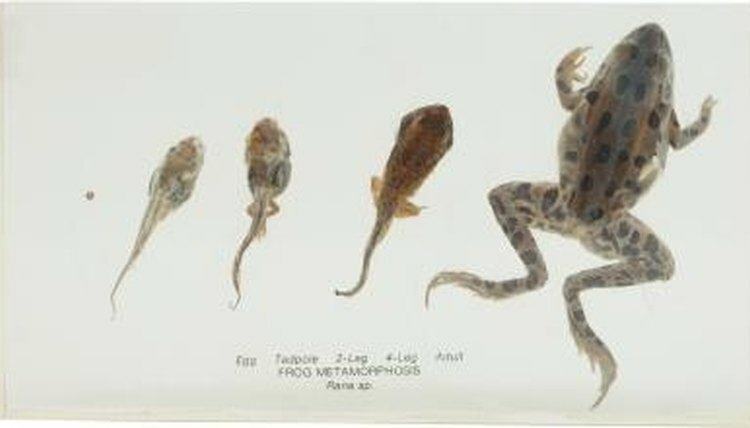 The mainstay of the tadpole diet is algae, especially when the tadpoles are small. Tiny tadpoles younger than a week old usually stay in one place and consume whatever algae they can find there. As they get a bit older, they start to swim freely. They’ll continue to eat algae, but they'll begin to nibble on plant stems and leaves, along with any dead insects they come upon. Bigger tadpoles can catch and eat live bugs. Some types of frogs, such as bullfrogs, can remain in the tadpole stage as long as two years and may get quite large before they begin to change. What Do Tadpoles Look Like When They Hatch? How Fast Do Pacman Frogs Grow? What Does a Strawberry Dart Frog Eat? How Do Frogs Start Out From Birth? What Do Tadpoles Need to Survive? Are Poison Dart Frogs Omnivores?